Short Fiction Monday: Our weekly exploration of free and inexpensive short fiction available on the internet. 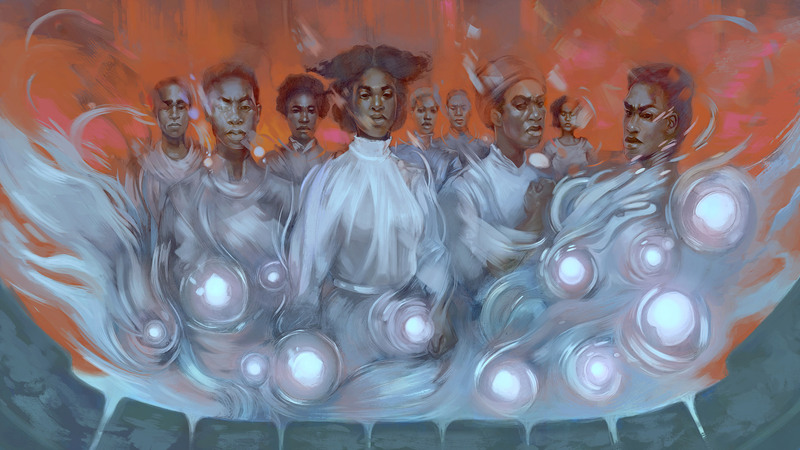 This week’s column features more of the 2018 Nebula award-nominated novelettes and short stories. Messenger by Yudhanjaya Wijeratne & R.R. 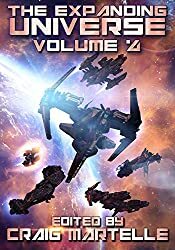 Virdi (2018, contained in The Expanding Universe 4: Space Adventure, Alien Contact, & Military Science Fiction, 99c Kindle anthology). 2018 Nebula award nominee (novelette). 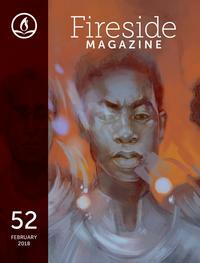 Messenger takes the giant mecha vs. alien monsters subgenre of SF (think Pacific Rim) and gives it a Hindu god twist. Aliens land on Earth’s moon and, not long after, on Earth itself, first crashing into Bangalore, India and into the home of Arjun Shetty, recently retired from the Indian Army reserves. The alien crash instantly kills Shetty’s pregnant wife and child. Shetty, distraught, volunteers to become a Shikari (“hunter”), a hundred-meter tall cyborg warrior called Vishnu’s Vengeance made to fight the huge aliens that are now landing in greater numbers. But life as a giant godlike cyborg has its drawbacks, and Shetty ― and other Shikari ― begin to have difficulty functioning, some even hallucinating that they are the gods they are named after. Wijeratne and Virdi vividly create the viewpoint of Shetty, struggling to maintain his sanity and fulfill Vishnu’s role as a protector of men … but it’s hard to keep that focus when Shetty is constantly called “Father” or “Vishnu” by his crew and sees humans as ants surrounding him. The woman who has become the Kali Shikari has an even more difficult time with her worshipful crew. The Kali technicians have always been more than just technicians. They worship her. My children call me father, but Bay Six … We’ve all heard the stories. It’s no small thing to see your gods come alive. And servicing the Mother Goddess has always been more than just an oil change. “A Witch’s Guide to Escape: A Practical Compendium of Portal Fantasies” by Alix E. Harrow (2018, free at Apex magazine, $2.99 Kindle magazine issue). 2018 Nebula award nominee (short story). There have only even been two kinds of librarians . . . the prudish, bitter ones with lipstick running into the cracks around the lips who believe the books are their personal property and patrons are dangerous delinquents come to steal them; and witches. It comes as no surprise that our narrator is the latter type. And in this story she struggles with the rules of witch-librarians as she regularly observes a teenage foster-child who clearly leads an unhappy life and is in need of some sort of escape. The literary kind. of course, since he’s there to check out books, but perhaps as well the more literal sort. And thus the narrator’s dilemma: does she follow the rules, or does she give the boy the book she knows he so desperately needs? The Substance of My Lives, the Accidents of Our Births by José Pablo Iriarte (2018, free at Lightspeed; $3.99 Kindle magazine issue). 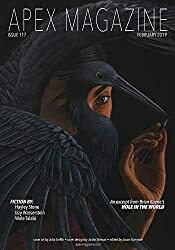 2018 Nebula award nominee (novelette). The Substance of My Lives, the Accidents of Our Births follows Jamie, a non-binary teenager who remembers their past lives; or, more accurately, remembers that they’ve had past lives. That is to say, some memories remain, but specific details of those memories are imprecise. I think it is important to acknowledge, up front, that when I started reading this story, I had high hopes: firstly, because The Substance of My Lives, the Accidents of Our Births is a Nebula award finalist in the novelette category (I’ve read many Nebula Award finalists over the years and enjoyed a lot of them); and secondly, because I’m always excited to encounter stories with non-binary main characters since I’m the non-binary main character of my own life. While the basic premise of a non-binary character being at ease in their gender because they remember being other genders in their past lives intrigued me, it wasn’t enough to keep me interested throughout what is, overall, a mundane story. 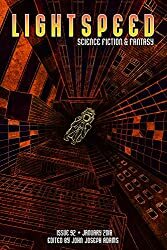 The speculative aspect of the story is critical to the novelette, but it is also somewhat confusing: is this kind of memory recall common in the world being created? Is it unique? Is the reader to assume other people have Jamie’s ability, or other non-binary people, or no other people at all? These and many more of my worldbuilding questions went unanswered. The Substance of My Lives, the Accidents of Our Births demands a great deal of suspension of disbelief and it didn’t give me a lot of reason to do so.